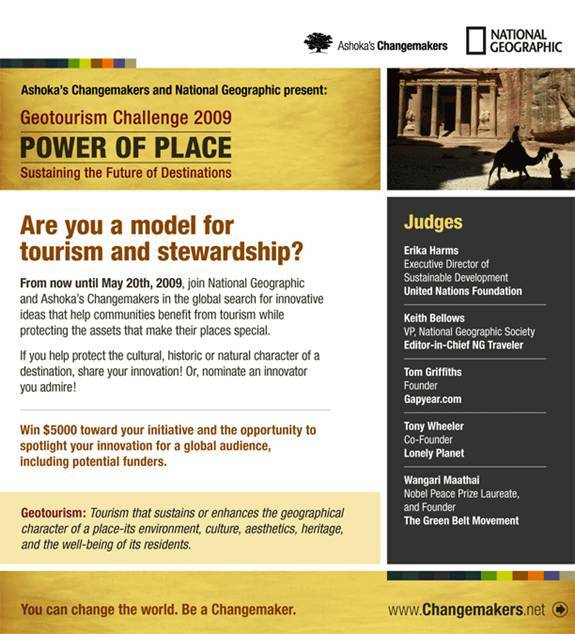 The 2009 Geotourism Challenge is on again! Nominate or enroll now. The goal of the Geotourism Challenge is to identify and showcase innovators - individuals and organizations - that directly or indirectly support good destination stewardship and the approach known as geotourism. Geotourism is defined by National Geographic as tourism that sustains or enhances the geographical character of a place: its environment, heritage, culture, aesthetics, and the well-being of its residents. Reflect the theme of the competition: geotourism. Entries are invited from organizations in all countries. We are looking for innovations that are beyond the idea stage. Entries must be submitted in English or in Spanish and be complete in order to be eligible. Innovation: Your entry must describe how your program or activity is new and different. Please be clear and explicit: How is your innovation directly or indirectly advancing tourism that sustains or enhances the geographical character of a place, its environment, culture, aesthetics, heritage, and the well-being of its residents? This criterion is mandatory for inclusion in the Geotourism Challenge. Social Impact: Your innovation must already be showing results. Your demonstrable success may be local, regional, or global. Regardless of extent, the innovation should show potential to affect the world and not just one place. Describe clearly and precisely how your innovation can be replicated and scaled up. Sustainability/Viability: Your innovation must be self-sustaining to be effective. Explain your plan for financial and other bases of support for the long-term. Include not only current financing, but the business plan for the future. Describe as much as you are comfortable disclosing. Andrei Bastos faz entrevista sobre falta de acessibilidade na Quinta da Boa Vista e na orla de Copacabana. While a guest of Tourism KwaZulu Natal I had the good fortune to meet the charming yet fiercely resilient Shakila Mahraj. An article in today's Deccan Herald recounts her extraordinary as a woman with blindness who has risen to prominence in the face of persistent discrimination to prove her many skills in service to her country and to the international community of persons with disabilities. As the author, Subramani M, notes, " The cause of Shakila's blindness is not a visual condition but a political one; Apartheid." Not mentioned in the following article is the fact that Shakila sits on the KwaZulu province tourism board advisory council and has single-handedly organized the Inclusive Tourism presence at this year's South African international tourism expo - Indaba. Despite her short, thin frame, there is something distinctive about Shakila Maharaj. The vividly Irish accent contrasted with her Indian mannerism and the way she narrated her life story had the hallmarks of the fabled 'African wisdom'. Any surprise this may have caused would vanish in an instant as you hear that Ms Maharaj is a South African Indian and has spent several years in Dublin (Ireland). What may hold our interest in her is the fact that she runs four successful companies in Durban and could do that without allowing her visual challenge to stand in the way. To be blind and have a professional career is one thing, but having that disability and running four businesses -- albeit with partnerships -- is quite another. "Oh yes, this is business, but this is certainly something based on my core expertise in training and psychology," Shakila (49) explained. But still, she has taken less than five years to develop the businesses and is slowly expanding her orientation programme for companies outside her homeland. All this after losing eyesight by 17, dropping out of school, suffering rejection due to disability at work and by her own family. The cause of Shakila's blindness is not a visual condition but a political one; Apartheid. In fact, but for the politics of her country in those times, she would have actually been seeing the world now. Aged 12, she slipped down a long flight of stairs as she drove a toy car one day. "There wasn't much of an impact initially, but doctors in Ireland -- where my parents took me in the hope of finding a cure for my impairment -- suspected that fall from the staircase as the reason for the dwindling vision. This could have been found and treated at an early stage in South Africa itself, but being non-Whites we had no access to advanced treatment then." Preoccupation with restoring her vision meant that Shakila had to frequently absent herself from the school she attended in Ireland. This might have been "fun" in childhood, but as her peers passed out of school and pursued their college, the loss was telling. While the uncertain situation would have left anyone descend into conditions far worse, Shakila found her feet. The first decision was to continue with her education. Wanting to be closer to her father brought her back to South Africa, where she joined the school for the blind in Pietermaritzburg. Getting her Masters in Psychology in the University of Durban (Westphalia) and tutoring there, Shakila often felt like doing more. Which took her to Columbia University (New York) for a masters in organisational psychology. Before leaving Durban, Shakila met her husband Naresh Maharaj. Being an able-bodied person in love with a visually challenged girl and his subsequent plan to marry her didn't go down well with his family, who were against the idea from the beginning. To reaffirm his love for Shakila, Naresh travelled down to New York to propose to her. "I was touched by this and accepted his proposal for marriage," she said. Married life wasn't as pleasant as she expected. The hostility that arose due to her disability, which she expected would fade away in time, was in fact growing stronger in Naresh's family. "That was perhaps the most trying period of my life. Not only was living with my husband's family a challenge, but my quest to intern with companies in Durban was proving to be difficult as well," she said. Poor treatment at home and a fruitless search for a job forced Shakila to leave South Africa. Ireland, the only other place she knew well, sounded like a good place to start afresh. With her husband, Shakila ventured into something totally new and exciting: women fashion stores. Besides a successful business, the venture also resulted in a book on how to run fashion stores successfully. But changes in South Africa -- especially the imminent departure of Apartheid system-- meant that Shakila had got back the urge to return home. Her enthusiasm was short-lived as all the problems that first chased her out came crowding back again. While resentment for the blind daughter-in-law grew stronger with Naresh's parents, the arrival of their first and only child increased tensions. The parents-in-law sought the custody of Shakila's son on the grounds that she was incapable of caring for it. But pre-empting them, Shakila moved the court to secure the 'barring order' that disallowed any claim from her in-laws on her son. Today, she is not only a successful professional but also a successful mother to her son Prashanth. "I keep telling people that our progress at times is stalled by self doubt. If people start to discover the spirit and self belief they have as children, surely they would generate solutions and not problems. This is what I learnt in the most trying times of my life," she said. Sometimes a virtual tour through the eyes of someone with a disability can be as moving as being there yourself. The organization Network of Organizations Working for Persons with Disabilities, Pakistan (NOWPDP) organized an art show for children with disabilities. The following slideshows offer a tender human look at life in a contested country. 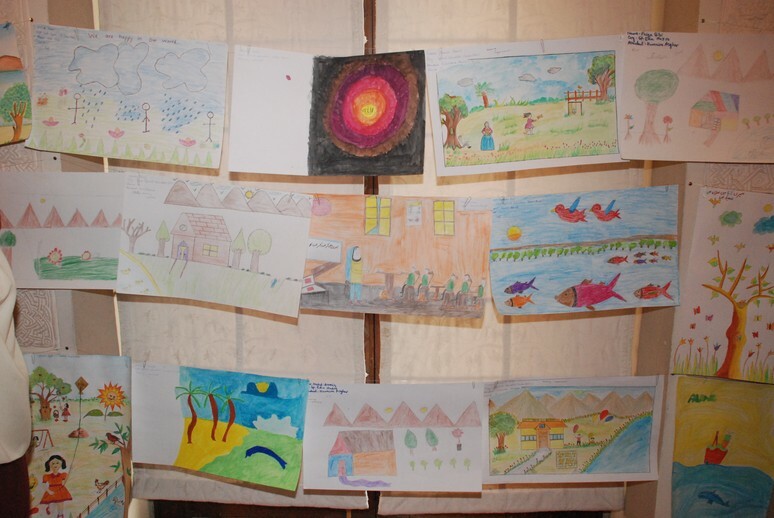 NOWPDP recently organized a series of Art Contests "Meri Dunya ke Rung" (The colors of my world) for children with disabilities in Karachi, Lahore and Islamabad respectively. With an average of about 150 participants in each location, it turned out to be a huge success by the grace of God. On behalf of the team of NOWPDP, I would like to take this opportunity to thank all our members, volunteers, sponsors and well wishers. Looking forward to working with you all in future also. NOWPDP, or the 'Network of Organizations Working for Persons with Disabilities, Pakistan' is an initiative taken by His Highness the Aga Khan Council for Pakistan, launched on the 9th of May 2008. Its primary aim is to make a significant difference to the quality of life and welfare of persons with disabilities by the provision of strategic support augmenting the functioning of organizations working for, and with, such persons across Pakistan. NOWPDP's approach to its goal is multifaceted. The Network stands as an apolitical, non-sectarian, non-partisan and neutral platform, and will conduct its programmes without regard to faith, origin or gender. NOWPDP intends to create space and voice for persons with disabilities and the organizations working for them, and advocate the obstacles faced by them to key socio-political and economic stakeholders. As a Network, it will form linkages between organizations working for people with disabilities and corporations, the state and media. We also aim to facilitate the planning and implementation of governance, management and operations programs and activities of our member organizations as well as expand their capacity development to this end. To pursue its objectives, NOWPDP will rely on the energy, dedication, and skill of volunteers as well as remunerated professionals, and draw upon the talents of people of all faiths. NOWPDP seeks to take effective and concrete action by working with similarly-minded organizations to create synergistic and lasting change in the existing vacuum swallowing the rights of people with disabilities and denying them the social justice, dignity and equality that is their birthright as much as it is anyone else's. "Everyone Has a Right to Travel"
Although, about a year ago, I had the Carlo Besta Italian National Neurological Institute in Milan change the date of its conference on Tourism and Disability to allow me to attend the Brazilian REATECH Expo and address the combined i-CREATE and ICAT 2009 in Singapore it was not possible for me to attend more than the excellently executed Milan event. Reports of the Brazilian and Singapore events have come in. Each appears to have had logistical problems. REATECH planners built inaccessible stages and presentation areas. ICAT missed some publicity opportunities. A new articulate voice in Inclusive Tourism, Yeoh Siew Hoon, makes reference to the poor planning and the squandered 24 months of potential publicity since ICAT 2007 in Bangkok. Her piece " Everyone Has a Right to Travel" provides an insider's look at ICAT 2009. In spite of the failure of ICAT 2009 to live up to its public potential the article reveals one of the most important developments we observe occurring around the world - cascading industry interest. Other than two representatives from the Singapore Tourism Board, the only other tourism delegates were my panelists and I. And let me say that Maggie White of Tourism Australia, Evan Lewis of Accor Asia Pacific, George Booth of Tourism Integrated Services, Kliff Ang of Asia Travel and I learnt more from our involvement than the delegates could ever learn from us. There were delegates from Spain, India, Switzerland, France, Thailand, Philippines and Taiwan, all wanting to learn from how to make their countries more accessible to travellers. There were academicians from Hong Kong and Dubai, wanting to learn more about new technologies to improve life for their disabled and elderly. Kudos to the generous contributors and their eye for opportunity! I was fortunate enough to be contacted by Jessica Zarin Kessin. She created Development by Design. DbD designs toys for kids with developmental disabilities -- and everyone else. A child's job is play, however there are millions of children that do not have the option of toys that are designed with their needs and abilities in mind. Development by Design is changing that. DbD uses Universal Design to create toys and games that all children can engage in, learn from and most importantly have fun!! One out of every five kids in the US is currently diagnosed with a disability, and one out of every 100 kids has Autism. DbD toys are not age specific, but skill specific, making them perfect for all kids! Our unique icon system makes choosing the perfect toy simple. DbD toys aid in the development of cognitive, motor, emotional and social skills by targeting forty skills in ten distinct areas of development. DbD toys allow kids, with or without special needs, the opportunity to develop new skills and have fun just being kids! 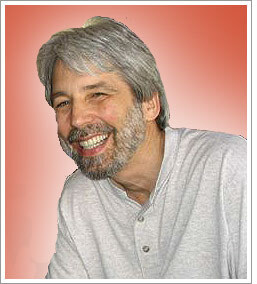 In 1975 I co-founded the first Disabled Students Union at the University of Washington. At the same time disability activists were wrapping up a campaign that eventually made Seattle Metro Transit the first accessible bus system in the world. It is 2009. The CRPD has been passed. How can stories like these still be in the news? 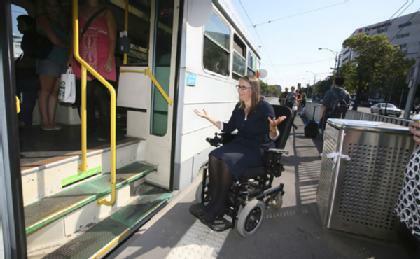 WENDY Brooks' office might overlook two tram lines, but that doesn't mean the senior manager at Melbourne University, who is in a wheelchair, can take a tram to work. While there are raised tram "super stops" on the two lines, the older-style trams that run in the area are not accessible by wheelchair and won't be modernised for many years. Ms Brooks is forced to get a bus from her Port Melbourne home (also near a tram line), then wheel herself the final kilometre to work. That trip will usually take almost as long as the preceding bus journey. I wish I could wave a wand or wiggle my nose to give people instant understanding about how my work as an interior designer impacts the public health, safety and welfare. But I think it would take the power of a wizard to overcome misconceptions, promulgated by cable decorating shows and the myriad magazine articles, that interior design consists only of set design and decorating. Although interior designers do make spaces beautiful, all designs must always be functional and meet life-safety and building codes. NCIDQ is aware that many people do not have a full understanding of our profession. We believe that educating the public is part of our mission to protect the health, safety and welfare of the public. Several years ago NCIDQ began researching civil law suits and actions undertaken by licensed or unlicensed interior designers that had put the public at risk. That research led the organization to conclude a graphic representation was necessary to effectively demonstrate how qualified interior designers affect the safety and well-being of users in interior spaces. NCIDQ developed an interactive Web site that provides information and graphic presentation to legislators, consumers and other design professionals. If a picture is worth a thousand words, then NCIDQ's hope is that an interactive Web site is worth two thousand accurate words. View the Web site by clicking the link at www.ncidq.org. The heart of the site is a floor plan of a 10,000- square-foot space within a three-story commercial office building. A viewer clicks on a quadrant of the plan and zooms in for a closer view. The floor plan is shown as a blank building shell, without interior walls. Then, by overlaying a separate layer, we indicate where an interior designer would locate the walls to define the work spaces and create egress corridors. Different rooms are highlighted to indicate that more information can be found by clicking within the room. For example, if you click on one of the small private toilet rooms, the plan transforms from a plan view to a perspective view. Several numbers appear, each representing specific knowledge that an interior designer must have to design a safe toilet room that meets building codes and the requirements of the Americans with Disabilities Act (ADA). 1. Lavatory sinks are mounted at a height that allows a wheelchair user clear access. 2. Faucet controls are accessible to meet ADA Guidelines; exposed pipes under open counter are wrapped to protect legs from pipe burns. 3. Wheelchair turning radius is 30" (60" diameter circle) to meet ADA Guidelines. 4. Proper seat height for water closet is provided. Correctly sized grab bars are mounted at the appropriate height to meet ADA Guidelines. 5. Floor tile has appropriate coefficient of friction rating to reduce chance of slipping. 6. Proper ventilation and light levels are specified to meet code requirements. 7. Faucets and toilets are low flow/flush for water conservation. We believe this Web site will be a great tool to demonstrate to legislators, legislative aides and the public the work of interior designers. When we designed the site, we were cognizant that consumers and legislators may have little time to devote to reviewing the site. As a result, we designed the site to be simple to navigate and to have clear content. Complex interactive features, or features that take a long time to load, would never be viewed by those that need to see them most. This "Health, Safety & Welfare floor plan" page of the NCIDQ Web site is yet another tool that designers can use to explain why our profession must have minimum requirements of education, experience and examination to protect the public. Please take a few minutes to visit the site, explore the information contained in it, and then forward a link to your friends, family, clients, and - most importantly - your legislators. Mary Jane Grigsby is a licensed interior designer and owner of Adesso Design, Inc., a commercial and residential firm located in South Florida. In addition to her work, she has been serving the design community for 34 years and serves on the NCIDQ Board of Directors. More information about NCIDQ, as well as a link to the Health, Safety & Welfare floor plan, is available at www.ncidq.org. In Milan at the Carlo Besta conference on travel and disability covered under Travelogues I met Roberto Vitali. He is Project Manager at Village for All - a network promoting Inclusive Travel. Here is their web site in Italian. Preparations are well under way for the ENAT International Congress 2009, which will take place at the Austria Center, Vienna on 30 September to 1 October 2009. The Congress is sponsored by the Federal Ministry of Economics and Labour, and is organised by the ENAT National Coordinator for Austria, IBFT. Visit the Congress Website for full details. Participation is free for persons whose abstracts are accepted. There is a reduced participation fee for ENAT Members. Don't miss it! The European Commission has launched a public consultation to gather opinions about making design an integral part of European innovation policy. A positive outcome to the consultation could lead to new EC funding programmes and initiatives in support of "user-centred innovation" through design - something which ENAT believes is much needed in the travel and tourism industry. Read more and answer the questionnaire. Do you have news, an event, a project or a good practice you would like to share? European Network for Accessible Tourism asbl. Accessible Tourism around the world. ISAC - Centro de Inclus?o Socioambiental do Cego em parceria com a Funda? ?o Florestal e Viveiro Florestal de Pindamonhangaba realizou no dia 23 e 24 de abril de 2009 a? "I?Oficina de desenho do Viveiro Adaptado e da organiza? ?o do espa?o"?tendo como eixo o Projeto" Mata Atlantica Plantar Superando Barreiras".? Foi realizado no Viveiro Florestal de Pindamonhangaba. Iniciou com a apresenta? ?o de todos os presentes em sua maioria pessoas?de vis?o nula,? de baixa vis?o e deficientes físicos, interessados na área?e representantes locais, e da comunidade. As palestras aconteceram de forma vivencial, interativa e com experiência sensorial iniciou com a EngenheiroFlorestal Alcinéia Guimar?es de Castro do?Instituto Florestal:?? Viveiro de Produ? ?o de Mudas onde tiveram a oportunidade de conhecer o processo de forma? ?o de um viveiro florestal, sentir e tocar várias espécies de plantas e sementes, orienta? ?o sobre o local, diálogos sobre o processo de forma? ?o de um viveiro, canteiros, o substrato, o trato com as espécies nativas, as sementes, identifica? ?es e formas de utiliza??o.? O Ornitólogo e responsável pelo Parque Jo?o Pedro Cardoso e Viveiro Florestal Laércio Toledo Cortez, com a temática?Observa? ?o da Fauna e a Inclus?o Social dos Cegos,??apresentou? ?angulos importantes do potencial que o turismo de observa? ?o de aves em todos aspectos pode descortinar aos participantes,? Técnica em Inclus?o Prof.a Ruth Souza Saleme: "A Importancia do Pensar na Constru? ?o da Inclus?o-Acessibilidade nos parametros do Viveiro."? Engenheiro Florestal e? ?Supervisor do Projeto?Renato Lorza:? "Tipos de vegeta? ?o, escolha de espécies"?apresentou mapa tátil do Estado de S?o Paulo", que possibilitou a compreens?o e interesse de todos pela temática; muito colorido, texturizado com vários elementos e contornos, e de acordo com a distribui? ?o da vegeta? ?o a compreens?o dos recursos hídricos, o Rio Paraíba do Sul, essa experimenta? ?o sensorial, tátil e visual tem levantado a expectativa para a concretiza? ?o e o manejo no viveiro adaptado, tanto pelos deficientes visuais quanto à todos participantes do Projeto.
? "O reconhecimento e Socializa? ?o do espa?o do viveiro adaptado e estufaatravés da Maquete"?com a Técnica em Meio Ambiente: Juliana O Motta também possibilotu a explora? ?o em cada micro unidade t?o bem miniaturizada, ali muitos refizeram os passos, identificavam as espéciestocando-as, o caminho de chegada e partida através das texturas, chegavam até mesmo a buscar na memória visual o local onde os colegas se colocavam.? Olocal aonde preparavam algum elemento para o viveiro r nesse espírito de criatividade foram sugerindo a marca? ?o do local aonde será o viveiro adaptado e na seqüência a? "Vivência da co-responsabilidade ambiental no espa?o"?com Antonio Carlos e Jose Monteiro deficientes visuais, que de forma participativa e de acordo com suas possibilidades participam desse processo de constru??o.? O coordenador do CISAC Ayrton Sergio Saleme?"comunica? ?o do Projeto" comentou emocionado sobre que as dificuldades s?o menores e bem melhores na experimenta? ?o desta oficina que busca de forma integrada, participativa e reflexiva, atravessar os limites culturais e deixar fluir a consciência ambiental e desta constru? ?o conjunta poderá existir possibilidades, dos atores sociais semearem o surgimento de um novo olhar, que independente do brilho, manterá a luz da existência com qualidade de vida inspirando o presente e para gera? ?es futuras. A new study indicates that far more Americans than previously estimated-5.6 million people, or about 1 in 50-have some level of paralysis in their arms and/or legs. The reason for the increase has to do with a shift in definition rather than demographics; people or their family members were simply asked about functional capabilities rather than their conformance to a specific medical model. The study didn't even count non-nervous system causes for limited limb movement, such as arthritis. Moral for product developers: scratch a functional definition and find a more significant market for universal design features than you may have thought. New Delhi: Thanks to a small request from a woman with disabilities and a prompt response by the New Delhi Municipal Council (NDMC) authorities, wheelchair users in the Capital can now visit the sprawling Central Park of Connaught Place without any inconvenience and enjoy its greenery and fountains like any other visitor. Neeru Gautam, a young wheelchair user, rang up the NDMC a week ago with a request to make Connaught Place and its Central Park more accessible for people with disabilities. "Being a woman with disabilities, I found it difficult to come from my home in West Patel Nagar to Connaught Place to enjoy an outing in the Central Park. I phoned up NDMC Junior Engineer Satbir Singh and Executive Engineer Nimesh, who promptly responded to my request. I am happy that the official machinery reacted positively and 14 ramps have been built on the inner circle including the Central Park," said Ms. Gautam enjoying her outing in the Central Park on Saturday evening. Um grupo de cidad?os portadores de incapacidade foi ontem convidado a almo?ar na Escola de Hotelaria e Turismo de Coimbra (EHTC) para que os futuros profissionais de hotelaria e restaura? ?o com eles pudessem aprender mais sobre as especificidades do atendimento a pessoas com limita??es. Isto porque, a par de estruturas físicas acessíveis, o "turismo para todos" passa por atitudes e comportamentos, por profissionais sensibilizados e dispostos a ajudar. A iniciativa, realizada em parceria com o projecto "Lous? - Destino de Turismo Acessível", contou com a presen?a da secretária de Estado adjunta e da Reabilita? ?o, Idália Moniz, que apelou ao empenho de todos na mudan?a para uma sociedade mais inclusiva e democrática, com ?igualdade de acesso a bens e servi?os?. A governante lembrou ainda que o turismo acessível pode e deve ser olhado como ?oportunidade de desenvolvimento estratégico sustentado?, como tem acontecido na Lous?. ?Este projecto fez com que mais investidores procurassem a Lous?, a sua única unidade hoteleira tenha uma ocupa? ?o acima da média e mais estrangeiros se fixassem no concelho?, sustentou, considerando-o exemplo a seguir. ?N?o foi nenhuma ideia luminosa, mas antes uma necessidade que sentimos?, acrescentou o presidente da Camara da Lous?, lembrando o convívio da comunidade com a Associa? ?o de Recupera? ?o Cidad?os Inadaptados da Lous? (ARCIL) - que ontem trouxe para o almo?o 20 utentes - e os muitos passos dados no sentido de uma sociedade mais inclusiva. O projecto "Destino de Turismo Acessível" foi, segundo Fernando Carvalho, apresentado em Portugal e no estrangeiro e apresenta-se como vector de ?dinamica económica importante?, tendo, inclusive, existido contactos com uma empresa britanica interessada em investir na cria? ?o de uma casa adaptada a cidad?os com deficiência. De resto, em termos municipais, ?inventariamos os erros todos [nas acessibilidades] e sabemos quanto custa emendá-los, aprendemos a partir deste projecto a n?o fazer mais nada de errado?, referiu. Os ingredientes s?o os mesmos, a apresenta? ?o e a confec? ?o tiveram cuidados especiais e o servi?o beneficiou ainda do entusiasmo e da dedica? ?o que os alunos quiseram mostrar a estes clientes especiais. Isso mesmo disse o chefe Luís Lavrador no final da refei??o. O professor da Escola de Hotelaria explicou que a carne foi empratada cortada aos peda?os pequenos e que também a sobremesa foi composta de pequenas pe?as de fruta e doces, que podiam ser comidas com as m?os. As restantes particularidades do servi?o est?o na aten? ?o à pessoa. Ana Paula Pais, directora da EHTC, revelou que este ?momento de aprendizagem? - que surgiu depois de uma sess?o mais teórica - deverá ser repetido nos próximos anos lectivos, pelo valor que acrescentam à forma??o. ?Esperamos agora a vossa avalia? ?o e sugest?es?, disse, referindo-se particularmente às pessoas com incapacidade. No almo?o, confeccionado pelos alunos do último ano do curso de Cozinha e servido pelos finalistas do curso de Restaurante/Bar, estiveram ainda Filipe Carvalho, responsável do "Lous? - Destino de Turismo Acessível", e Marques Leandro, presidente da ARCIL, além de diversos responsáveis por institui? ?es da área do turismo e do apoio a cidad?os com deficiência. Uma ementa totalmente escrita em Braille foi apresentada num estabelecimento de restaura? ?o de Braga, tornando-o o primeiro do país a fazê-lo. Para assinalar a data foi descerrada uma placa onde o nome "CafféNoir" aparece também escrito na linguagem dos invisuais. Uma iniciativa que a ACAPO espera ver replicada no resto do país. Eduardo Gon?alves, o proprietário conta que a ideia come?ou a ganhar forma em conversas que ia tendo com um cliente invisual: "nós vemos ainda muito em contra-luz, olhamos muito para a nossa sombra e espero que este seja um contributo para mudar a pequena mentalidade que ainda reina no país". Para a responsável pela ACAPO de Braga, Cristina Ferreira, "já existem edifícios e locais adaptados para receber pessoas invisuais mas este é o primeiro estabelecimento do país a ter uma ementa inteiramente em Braille" e vai mais longe: "mesmo aqui na vizinha Espanha n?o tenho memória que exista alguma coisa parecida". Situado em perto da Sé de Braga, numa zona nobre da cidade, o café conhecido também pela oferta em termos de chá colocou uma placa identificativa, de fácil acesso aos invisuais e com o nome gravado em relevo para ser facilmente reconhecido pelos invisuais: "é mais um passo que se dá para transformar e desenvolver uma cidade ainda muito presa a 200 anos de história", reconhece o proprietário. Repasso este artigo publicado no Fórum de Idéias do Diário do Turismo O Fórum tem o objetivo de promover o debate e a discuss?o de temas mais profundos sobre o turismo brasileiro. Caro turismólogos, nunca poderia imaginar que um dia viesse a escrever o presente texto, e devo confessar que para mim bacharel em turismo e Ciências Sociais n?o foi nada fácil. 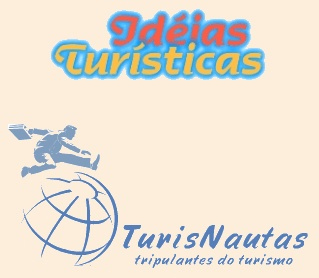 Pois minha consciência como cientista social levava-me a denunciar o que há por detrás da "Lei Geral do Turismo" n. 11.771 de 17 de Setembro de 2008. De outro como turismólogo fiquei indignado e perplexo com a mudez opinativa dos colegas perante o significado da "Lei Geral do Turismo". A quest?o agravante nesse caso se deve ao fato que a precariedade do estatuto jurídico que possuímos fica mais débil, pois qualquer outro profissional como o administrador (pelos seus interesses confessos em tentar incorporar os turismólogos na fileira dos administradores), o leigo, o político e o tecnólogo podem vir atuar no campo da capacita? ?o profissional e acadêmica. Sem mencionar que a Delibera? ?o Normativa No 390, de 28 de Maio de 1998 se refere à importancia do parecer técnico emitido por profissional egresso de cursos superiores de Bacharel em Turismo. Afinal, somos credenciados para assinar os pareceres técnicos e, n?o para fazer parte da "Lei Geral do Turismo", principalmente naquilo que ela tem de mais nobre o treinamento da m?o de obra e capacita? ?o profissional e acadêmica. Ser?o que n?o nos consideram educadores? Questionamos quem educa o educador, é o trade? Se assim for, para que servem os cursos de turismo? Para que o empresário da educa? ?o em turismo acumule capital ou para os nobres motivos da educa? ?o superior. Parece c?mico para n?o dizer trágico, o Estado formaliza um arcabou?o legal normativo sobre a "Lei geral do turismo" e n?o menciona seu trabalhador fundante o Turismólogo. Isso me faz lembrar em termos de galhofa o que seria; a lei geral da saúde, sem levar em conta o médico ou a enfermeira; a Política Nacional de Energia Nuclear, sem levar em conta os formados em física; a lei geral da advocacia sem levar em conta o bacharel em direito, e assim poderíamos enumerar inúmeras categorias profissionais. De outro lado, n?o podemos ficar sem aplaudir o conteúdo da lei que veio disciplinar, articular e dar foro legitima as leis que estavam esparsas e perdidas de dire? ?o quanto sua eficácia normativa. Entretanto, essa lei veio contrair ainda mais o mercado de trabalho para o turismólogo que vê sua especificidade laboral sendo invadida por outros profissionais, que após a implementa? ?o da mesma acabou nivelando todas as fun? ?es de turismo como atividades iguais. O que tira a especificidade do turismólogo e o coloca idêntico a qualquer outro profissional de nível superior, com a desvantagem que todos possuem uma forma? ?o especifica, menos o turismólogo que é produto daquela idéia retrógada e equivocada de que a forma? ?o do mesmo deve ser generalista. Impressiona a timidez com que o Estado explicita a quest?o do turismo sexual, como se o problema n?o fosse produto da atividade turística promovida sem critérios, na qual para se conseguir turista principalmente estrangeiro todo v?o Charter é bem vindo. Hoje só o nordeste recebe 28 v?os semanais fora os regulares aliados a quest?o da pobreza local, alimentam a indústria do turismo sexual. Por isso s?o inócuas as campanhas publicitárias, pois o que manda é for?a dos dólares: o hotel nada vê, o agenciador de garotas apesar de conhecer funcionários do estabelecimento e ser conhecido ninguém o conhece. Nos aeroportos quando da chegada dos v?os chartes a magia ocorre; agenciadores bilíngües negociam carne humana infantil, por hora, por dia ou por semana. Taxistas já sabem como recolher as garotas a maioria menor de idade, muitos turistas saem dos aeroportos e chegam acompanhados aos hotéis. E como n?o poderia deixar de ser, as autoridades ficam se esquivando de atuar, pois dizem que cada órg?o tem limites. Para finalizar esse breve comentário, n?o poderíamos deixar de refletir que nossa exclus?o como profissionais da "Lei Geral do turismo" se deve a nossa pouca organiza? ?o política e organizativa diante do lobby desenvolvido pela Associa? ?o Brasileira de Agentes de Viagem - ABAV, que por sinal está lutando para regulamentar as atividades profissionais do Agente de Viagem. Na qual encontramos uma série atividades que s?o contempladas aos agentes de viagens que também s?o desenvolvidas pelos bacharéis de turismo - turismólogos. A "lei Geral de Turismo" n?o substitui a necessidade da regulamenta? ?o da profiss?o de turismólogo, pois quem assim afirma trabalha em cima de uma falsa premissa. E nem podemos imaginar que aos Bacharéis de turismo poder?o constituir empresas para atuar em planejamento. Na verdade foi uma humilha? ?o para os turismólogos n?o serem mencionados na "Lei Geral do Turismo" é como falar do Brasil e esquecer-se de mencionar os brasileiros. Isso mais uma vez demonstra que o trade está somente preocupado com as quest?es econ?micas; aumentar a permanência do turista estrangeiro em território nacional, que o dólar n?o sofra nenhuma desvaloriza? ?o e que o turismólogo fique longe do turismo. Today a short Travelogue series will begin here at the Rolling Rains Report. Follow along here. 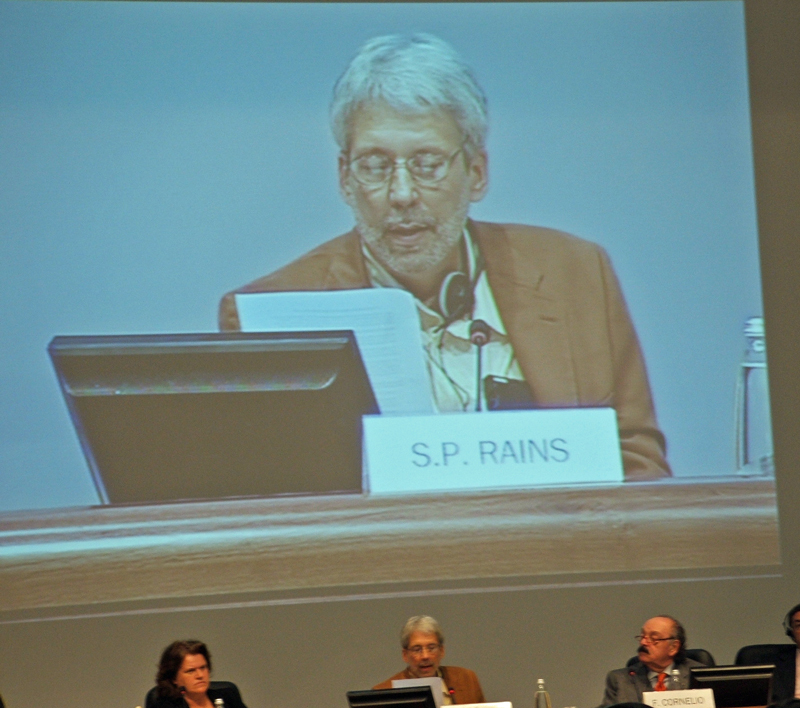 Scott Rains will address the conference "From Disability to Social Reinsertion" in Milan. His address, "Inclusive Tourism: Participant/Observer Notes on the Global Paradigm Shift Toward Solutions" on April 17 will be followed by participation in an April18 round table presentation on international policy regarding travel and disability. Of course, the initial step will include a series of flights to get from California to Italy. So the reports begun today about airline on National Public Radio has a particular immediacy. Especially noteworthy is National Public Radio's call for suggestions to include in an Airline Passenger's Bill of Rights. I encourage readers to submit their suggestions and provide the radio network's reporters with suggestions on where they can research about travel with disabilities! Follow along at the story "Creating a Passenger's Bill Rights"
Leave your suggestions in the comments section. Send your suggestions on Twitter using the #fixairlines tag. Viajar pelo Brasil é uma tarefa difícil para os portadores de deficiência. Mas existem lugares onde os acessos s?o facilitados. Um guia reuniu roteiros onde a divers?o é garantida para todos. Continue a transforma? ?o social com a distribui? ?o de oito mil cópias do guia. The main objective of the Brazil's 4th International Disability Film Festival is to promote and encourage new ways of seeing special needs and disabilities. The organizers accept films of any duration, genre and production date dealing with this issue. The Brazil's 4th International Disability Film Festival will take place in Rio de Janeiro in August, in Brasília in September and in S?o Paulo in October, 2009. Deadline for online submissions: May 11, 2009. Gina Hale over at Special Ed Insider blog takes on the "scarcity of resources" argument against inclusive design in a very grassroots way -- at the local school. She asks about making pools accessible but the argument gets to the roots of attitudes and the resulting allocation of resources. See the piece Pools Not Just for Athletes. Thank You Electronic Frontier Foundation! Readers here are aware of the recent fiasco where Amazon decided to handicap the Kindle 2. 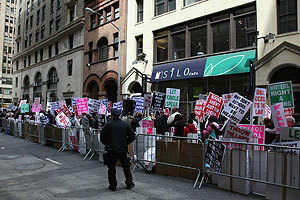 Some may have taken part in the protest yesterday at the headquarters of the Authors Guild in New York City yesterday. It is encouraging today to see coverage of this issue at the Electronic Frontier Foundation. Access to trustworthy information in accessible formats is essential for travelers. Backsliding on accessibility and industry hesitation to enfranchise the largest group of people possible with existing technology is damaging to the progress of inclusion in travel and leisure. Yesterday, hundreds of people gathered in front of the headquarters of The Authors Guild in New York City to protest the removal of text-to-speech capabilities in Amazon's new Kindle 2 ebook device. You may remember a few months ago, when The Authors Guild claimed (falsely) that the text-to-speech feature violated copyright law, and forced Amazon to disable it. Now, the people who would have benefited most from the new feature -- the blind, and others with reading disabilities -- have made it clear that they're not going to stand for it. Everything was of course peaceful and contained right in front of the Authors Guild's seventh floor offices on 32nd street on Manhattan's east side. They had a pretty fantastic march ring set up, with many folks leading those who could not see at all in the ring, and sighted people whose job was to tell the marchers when to turn. Several seeing eye dogs joined in expressing their distaste. Is Inclusive Travel on The Agenda? Comment Period: March 27 - April 17, 2009 - 3:00 P.M. E.D.T. Dr Scott Rains will speak at Neurology in the Third Millennium: From Disability to Social Reinsertion held by the Carlo Besta Neurology Institute in Milan. His presentation Inclusive Tourism - Participant/Observer Notes on the Global Paradigm Shift Toward Solutions on April 17 will be followed by his participation in the Round Table on Policy and Travelers' Experience on April 18. The continued increase in longevity and greater chronicization of many illnesses in the third millennium is being accompanied by increasing numbers of disabled persons. Disability as a result of neurological illness forms a distinct and substantial part of disability that is characterized by high social costs and heavy impact on quality of life. Although considerable improvements in medicine and surgery - including the development of technologically advanced treatments, will occur, they are expected to have a limited impact on global indicators of disability in the near future. Conversely, rehabilitation interventions are expected to make a much more substantial contribution to alleviating disability in the coming years. But in order to have a maximal effect on quality of life, rehabilitation must go beyond traditional interventions and expand into leisure-time activities. And in this context accessible tourism can make an important contribution. This congress starts from socio-economic and health considerations to explore the vast perspectives and possibilities now opening up in the area of leisure time rehabilitation for those disabled as a result of neurological disease. The Voice of America interviews Jan Garrett, Director of Berkeley, California's Center for Independent Living, Esperanza Diaz Alvarez, Gerald Baptiste, and Melinda Hicks. GuideGecko (www.GuideGecko.com), a new website for travel, lifestyle and entertainment guides, provides the perfect platform for self-published accessible travel guides by independent authors. People with disabilities and disability organisations who create access guides to their cities, regions and countries, are often unable to publish the guides due to lack of resources. 50-75% on every sale. Guides can be updated at any time, ensuring the customer always has the latest version. will be spotted and bought. find information to help them travel. In order to make all tourism products accessible to all kinds of tourists, especially People with Disabilities (PwDs), Ministry of Tourism (MoT) will strongly enforce accessibility provisions in all the centrally-approved tourism projects. This information was divulged by Sujit Banerjee, Secretary - Tourism, Government of India at the inauguration of a two-day conference on Inclusive Tourism, 'Accessible Transportation and Tourism,' held in the capital. The conference...was organised by Svayam, an NGO, in conjunction with MoT and Transport Department, Government of Delhi. "We have decided not to give central financial assistance to projects which do not have facilities for differently- abled people. Incredible India cannot be called incredible if our destinations are not accessible to all kinds of people," he informed. Announcing the launch of a new NAPA-AAA organizational listserv on the intersection of anthropology and occupational therapy/occupational science. The group looks at research, teaching, and practice on health and well-being, disability, community development, community based rehabilitation, etc. all in the context of human occupation. National Association of Practicing Anthropologists, Occupational Therapy and Occupational Science Interdisciplinary Special Interest Group: The NAPA OT/OS SIG was organized in 2006 as a part of the American Anthropological Association, National Association of Practicing Anthropology. The NAPA OT/OS SIG is focused on becoming an academic presence at conferences, and building alliances and collaborations between anthropology and occupational therapy and occupational science. The group also collaborates with other groups including the Society for Medical Anthropology, Special Interest Group on Disability Research, the SSO, SDS, etc. The listserv is open to all for relevant announcements and theoretical and practical exchange. Join through Yahoo Groups : NAPA-OTOS@yahoogroups.com . Joining the list does not necessitate joining AAA or NAPA. Dalton Valim Alcoba Ruiz e o fundador do Portal Etur. www.ideiasturisticas.hpg.com.br no dia 10 de junho de 2000. Veja a primeira home aqui e em seguida aqui. Em seguida foi rebatizado de Etour (www.etour.hpg.com.br). Veja a home aqui. Em 2001 assume o dominio Estudos Turisticos (www.estudosturisticos.com.br). Veja aqui. O nome atual foi atribuido em 2004. Neste ano de 2009 Dalton estabelece novos servicos com "links" para nichos especificos sempre dentro da area de Turismo. (assim chamado em homenagem ao "nome de berco" do atual site). The Healthy House Institute nibbles at the green/Universal Design convergence with this quote from Wikipedia. Miguel Helft writes about T. V.'s continuing work to make technology available to blind users. Read his article, "Google's Phone Apps for the Blind, and Everyone Else." Since he cannot precisely hit a button on a touch screen, Mr. Raman created a dialer that works based on relative positions. It interprets any place where he first touches the screen as a 5, the center of a regular telephone dial pad. To dial any other number, he simply slides his finger in its direction -- up and to the left for 1, down and to the right for 9, and so on. If he makes a mistake, he can erase a digit simply by shaking the phone, which can detect motion. After the Robotic's Institute at Carnegie Mellon University and the IDeA Center at SUNY Buffalo issued press releases announcing that they were awarded the Rehabilitation Engineering Research Center on Accessible Public Transportation (RERC-APT), funded by the National Institute on Disability and Rehabilitation Research (NIDRR), many other outlets picked up the story. Co-directed by Aaron Steinfeld (RI) and Edward Steinfeld (IDeA Center), the RERC-APT will establish an effective and sustainable process to address high priority transportation needs of people with disabilities using enabling technology and universal design. Survey of User Needs (SUN) - A survey to help us understand how people with disabilities use wireless products like cell phones and text messengers. Encuesta de las Necesidades del Usuario (versión en espa?ol) - Una encuesta para entender cómo se utilizan las comunicaciones inalámbricas por personas con discapacidades. If this regulation is implemented correctly - that is with industry-standard, safely-constructed equipment sized to accommodate international passengers, and operated by trained staff - then this development is one of the most important in recent years for travelers with mobility impairments. Rather than shortsighted resistance the industry should now become proactive - in partnership with the Indian Ministry of Tourism - about the market that this progress will open to them. NEW DELHI, 31 Mar: In order to make flying a comfortable experience for disabled people, the Directorate General of Civil Aviation (DGCA) has made it mandatory for all airlines to carry aisle wheelchairs by July 31. This chair will be used for taking physically disabled passengers from their seats to toilet during flight or for being wheeled around on long or ultralong sectors. Interestingly, the DGCA had prepared its civil aviation requirement (CAR) for providing certain minimum facilities to the physically challenged last year but it remained a draft so far. Recently the court of chief commissioner for persons with disabilities pointed out that the DGCA had prepared a draft CAR but without the power to enforce the same, it may serve little purpose. The directorate then sought time to change its rules and has now amended them. The CAR for persons with disabilities is going to be strictly implemented. If the things this rule provides for like having aisle wheelchairs on all flights by July 31 are not adhered to, action will be taken against airlines,?Esaid a senior official. In the past, there have been several instances where airlines have refused to take physically challenged passengers on their flights. Now under CAR, airlines will be able to do so only in extreme cases where safety of aircraft or fellow passengers could be endangered. In fact, airlines can refuse an assistive device or even guide dog if the passenger has told them that he or she would be using them at time of booking. It also lays stress on training employees to take care of special needs of the physically challenged, including at the airport. The DGCA has also addressed airline industry objections to the provision of providing all assistance to disabled people free of cost contained in the original draft CAR. The carriers said that charging for assistance should be left to them alone. So under CAR, airlines are allowed to charge for stretchers and any extra material that it provided to the passenger. In fact, the DGCA has in recent past made several draft rules for passengers convenience. But the economic slowdown has meant that the aviation ministry has given higher priority to saving airlines and airport developers. As a result, CARs on passenger rights have taken a backseat. A case in point is a draft that provides compensation and penalty to passengers in case of deficiencies in service to passengers like being wrongly denied boarding to a confirm ticket holder or an inordinately long delay not caused by natural reasons. This draft CAR is yet to be finalised and issued. If this draft is issued, airlines will have to pay for deficiency in service. They have cited poor financial health and the draft has not been finalised and issued to date, said a senior official. Pam Taylor runs Flamingo Tours from Cape Town South Africa. In the following article she writes about her experience with inclusion as a tour operator offering safaris. 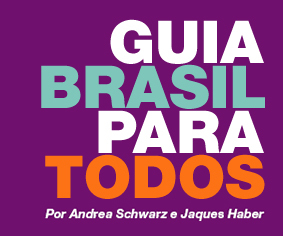 Veja o Guia Brasil para Todos.
? 377 dicas para viajantes. Falta todavia os detalhes e fotos dos cuartos nos hotéis pois no dia primeiro do lancamento o sitio e impressionante. Parabems!